Arturo “Thunder” Gatti was, as all fans agree, a special – very special – fighter. One who gave his all in the ring too many time to remember. No-one will ever forget Gatti; least of all his millions of fans and those men who had the honor (if that’s the right word) of meeting him in the ring. “Arturo Gatti was one of the hardest punchers I ever fought. I think only Azumah Nelson hit harder,” Gabriel recalls. “Gatti gave me my toughest fight though. We went back and forth! I hit the canvas and the referee stopped it. Too quickly I believe. I always wanted a rematch. 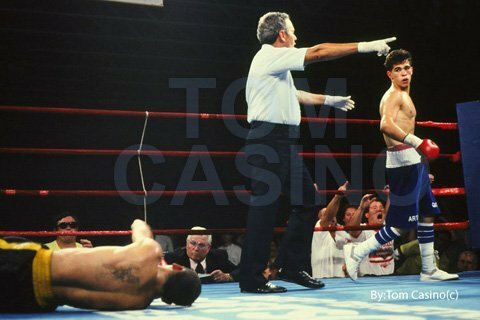 But it was definitely a great fight and I fought Gatti in his “house” (in Atlantic City). Indeed, The House that Gatti built.